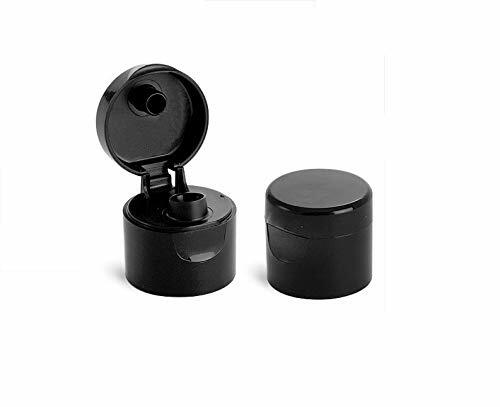 The black PP 20-410 smooth skirt hinged flip top snap cap dispensing cap. Flip top dispensing caps have a hinged lid that snaps into place. Because it is made of polypropylene (PP), this hinged cap can be opened and closed thousands of times before breaking. This lid is made of polypropylene (PP), which means it has a high heat tolerance level and an excellent resistance to fatigue. This closure fits a container with a 20-410 neck finish. The first number refers to the diameter of the container's opening (in mm). The second number refers to the thread/style/depth of the closure's skirt. Go to Amazon.com/wolfmoonbotanicals for more options for dispencing tops and bottles..
Flip top dispensing caps have a hinged lid that snaps into place. This hinged cap can be opened and closed thousands of times before breaking. 100% Satisfaction Guarantee, Mfg. in the USA so do not hesitate and purchase one. If you have any questions about this product by wolfmoon botanicals, contact us by completing and submitting the form below. If you are looking for a specif part number, please include it with your message.